The Fish Camp where we are parked is an excellent place to kayak if you aren’t alarmed by the occasional alligator sunning along the shoreline. Though we have not actually seen an alligator here, warnings not to let one sneak up on you are posted everywhere. Though Storm and I have not yet figured out where to mount a kayak on our rig, Matt and Sherry have a kayak that they have been transporting back and forth across the country in their RV but have not yet had a chance to actually use. This is not an ordinary everyday kayak either. 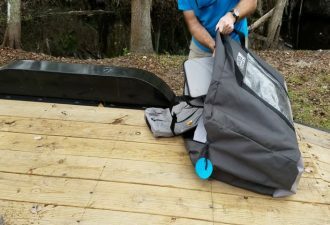 This is a super duper inflatable Advanced Elements kayak that transforms from the small package shown above into a full size 2 person craft. It will fit in the RV easily! So far each kayaker we have seen leave the dock has returned unharmed so we all decide to brave the wild waters, put this vessel in the lake and see what she can do. Sherry and I take it out after the guys finish the shake-down voyage and I am extremely impressed with how well the kayak handles and how easily it moves through the water. Guess I will be adding one of these to my toy wish list. Here is a video of our exploits including some long awaited drone footage by chief drone pilot Storm. Love it! The video and drone pictures turned out really well. You are great at editing. Miss you guys! I was hoping that you would like it – thanks for being the stars in my production! We miss you guys too! Tell Matt I got the internet thing worked out per his instructions – THANK YOU!! The world hates change; yet it is the only thing that has brought progress.